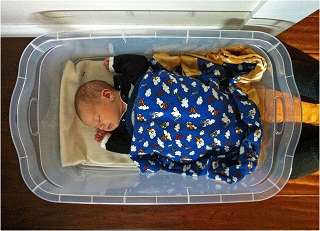 An idea for homemade baby wipes is to get a Rubbermaid container, with a tight fitting lid. Fill it with dry cotton rounds, the kind you use for removing your make-up. Then add a few squirts of baby oil, and fill the container with warm water. Close the container until you need a fresh wipe. They work just as well as the store-bought wipes but are cheaper, and in this way, you can be sure of what is touching your baby's skin. Thanks to Sherri for this great Frugal Baby Tip! I use cloth diaper, so for me it makes more sense to use a wash cloth that will be washed with the diapers. I keep a spray bottle with a water/soap/olive oil mixture to spray on my son's bottom to clean it and just wipe with a wash cloth.